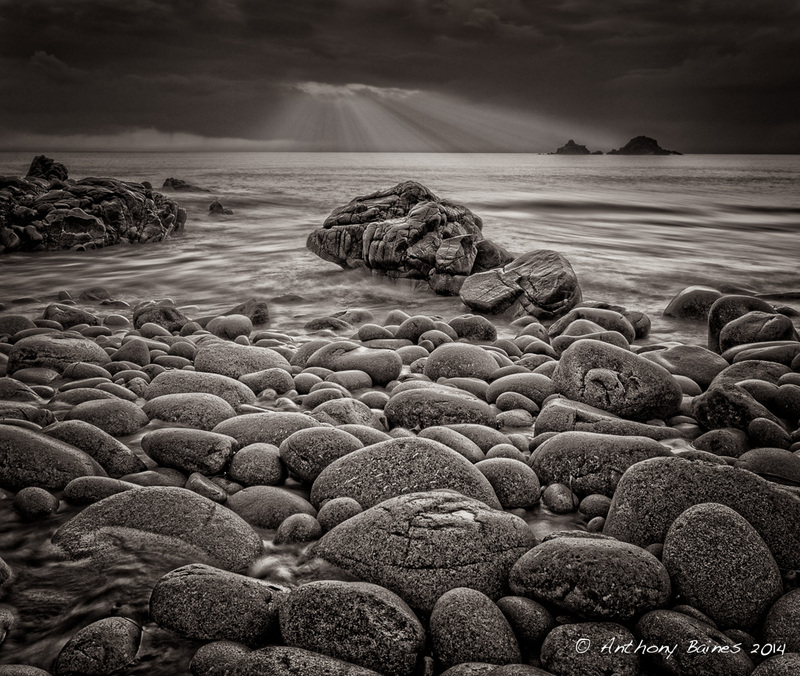 You may have seen in Martin's last blog piece his lovely picture from Porth Nanven beach in Cornwall, shown again, above. It was made when Wonky Horizons took a few days break down in Cornwall in March. There is a warm and very peaceful atmosphere to Martin's picture that I think is wonderful, especially as the weather that day was much worse than it looks. 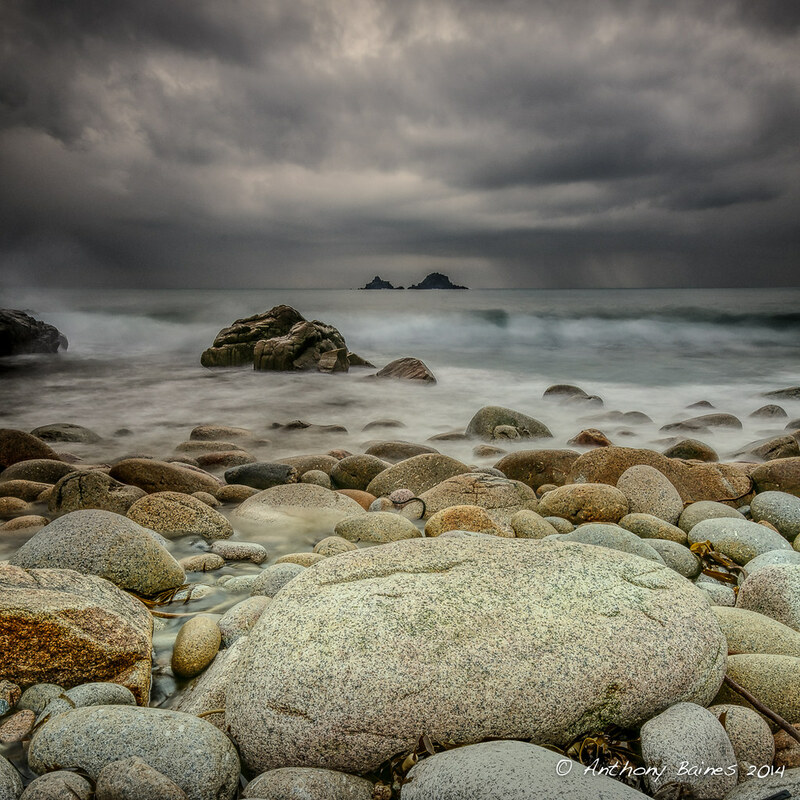 Porth Nanven beach is well-known for its large rounded boulders which are likened to dragons eggs. When we got there it was particularly cold, and a strong wind from off the sea was driving rain in our faces. Undeterred, Martin and I set up our tripods to take some landscapes, while Phil clambered around after more unusual angles. Martin was trying out his Big Stopper, and succeeded in getting a beautiful milky appearance in the water. For a different look, I just used a Lee 0.9 (three stop) standard neutral density filter so as to keep some texture and movement in the waves; this was stacked with a 0.6 ND hard grad. Martin also chose a better position than me, so his composition is better balanced with the far away islands over to the right balancing the heavy area towards the left. My version has the island in the centre, so the composition is not so well balanced, although the weight of the big dragon's egg in the foreground helps – I might move those islands sometime :-). I'm still a bit conflicted about the sky too: I'm not sure that the big expanse is really needed, but when I've cropped the sky down, that big boulder becomes just too dominant. Nevertheless, I'm pretty happy with my version because I like the colours, the comparatively forbidding atmosphere, and especially the movement in the sea. I've made a print from this that I think looks great. Going over the raw files more recently, I thought I would give another of them a go. This one has a more balanced composition with the far away islands over to the right, and I thought I would try a black-and-white version. This was a very simple conversion – I got the colours the way I like them in Lightroom, and then simply used a yellow filter black and white conversion for the image. I thought the sky needed a bit of perking up as well, so I moved a bright patch of cloud further down into the image, and added some beams of light. To make the beams, I used a method I had only just discovered in a video by Glyn Dewis. I think it adds a bit of drama to the image. I don't really have a favourite here – I think they're all valid interpretations of the scene, although I think the far away islands in my colour version are definitely going to get moved at some point!